Last term, we were fortunate enough to have award-winning UK Educator, Dr John Ingram, visit our school to give a presentation about The Digital Excellence Awards Program. We then visited Lynbrook Primary School where we saw, first-hand, this exciting program in action. We welcomed Dr John back to our school where he demonstrated his exciting program to our Junior School and ICT Staff. 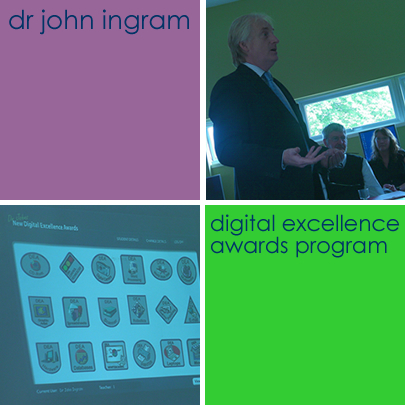 Click here for more information about Dr John Ingram and the Digital Excellence Awards Program. We used CoverItLive during the presentation to blog live. Click the green Play Replay button below to view the live blog. We would love your comments and feedback about the presentation! Click on the Comments link at the end of this blog post to submit your comment. Mankind is No Island was the winner of the Tropfest New York Short Film Festival. It was filmed using a mobile phone in Sydney and New York by Jason van Genderen. Our Director of Studies was keen to show it to me. “Brilliant” was the word he used to describe it. In following on from Blog Action Day and the topic of poverty, I felt that I should share this movie. Of course, I was impressed with the clever use of text and the perfect way in which the music was timed with each text image. However, the message was conveyed in such a powerful way – I was very emotional! 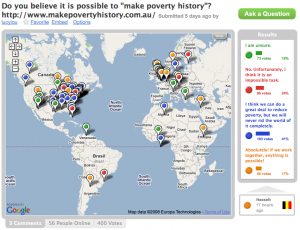 Blog Action Day – What does the world think about poverty? 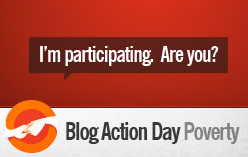 As I have only been blogging for a few months, I was not familiar with Blog Action Day. It was one of those times when I thought to myself, “I wish I had my own class!” In my role, I provide training and classroom support to staff so am often not able to organise an activity with “my own students”. However, the same day that the Blog Action Day tweet appeared from the amazing Edublogger, Sue Waters, I was also exploring a polling site called Ask 500 People. Ask 500 People allows you to submit votes to polls created by users from around the world and even create your own poll. It lends itself beautifully to questions where a global opinion is being saught. I thought that a poll about poverty might be a nice way to test out Ask 500 People. 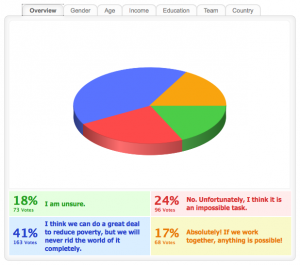 I never dreamed that I would be so amazed at what can be achieved with this tool! Absolutely! If we work together, anything is possible! I think we can do a great deal to reduce poverty, but we will never rid the world of it completely. No. Unfortunately, I think it is an impossible task. I was amazed to see that within 48 hours there were almost 400 votes from around the world! It was fascinating to see where voters were from and to see the results emerging, even after the first 24 hours. It is also possible for voters to submit a comment about a poll. This was another aspect of Ask 500 People that produced some lovely results, with three voters submitting their opinion about the topic of poverty. One, in particular, was quite a personal account of his own family’s experience. You can click here to read the entire comment. How do you define poverty? This website talks about the 30,000 children that die as a result of poverty every day. In my country no children die because of poverty, the poor in my country all have health insurance, can go to school and buy food. The poor in my country are those who can’t afford a holiday, a car, quality clothes and food, or join a sports club. Those are sad things, especially when you compare and the people around you can, but it is not the same kind of poverty. Although it is possible to view a Google Map with markers to indicate where your voters are from, apparently it is not possible to see the markers for all of the votes registered. I was not expecting 100% accuracy, but was a little concerned after some of the markers “disappeared”. However, a quick message to Ask 500 People resulted in a reply indicating that the markers shown were only for the most recent votes. For educators, I feel that Ask 500 People offers an incredible tool that gives you the ability to attract voters from around the world. With the right topic, it goes “one step further” than the usual polling sites.